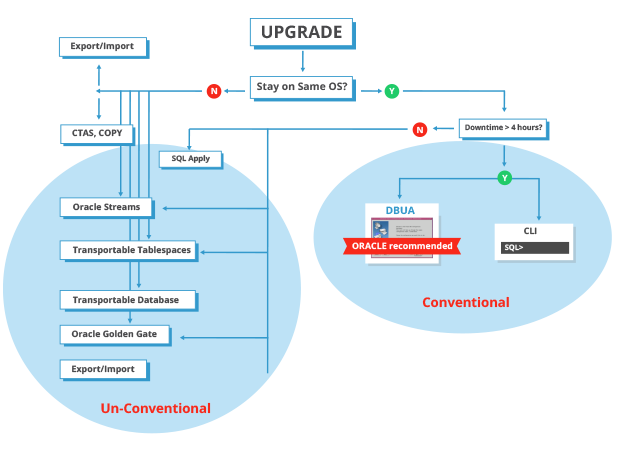 Upgrade, Migrate or Consolidate Your Oracle Database and save! We make upgrading or migrating your Oracle databases easy and can help save you money! Our upgrade calculator can take the guesswork out and we can usually provide a fixed price. Is your database being supported? Check the table below – it may be time for an upgrade! There are about a dozen ways to upgrade your database, both conventional and unconventional, depending on what you have in your current environment, where you are moving to, and how you want to get there. We have comprehensive experience getting our customers to their new release, and we can reduce the risk and headaches out of keeping your systems up to date. Eclipsys are one of 3 global Oracle partners participating with OCS to use the same methodology as the Oracle experts. We do these upgrades and migrations all the time and can decrease the risk to your mission critical systems. Eclipsys can help you consolidate your databases, and put in place an operational solution and service catalogue to provide a range of standardized options for your business and application owners. This allows IT to deploy standard templates for database resources, options, and availability, to allow you to offer on-demand provisioning and fast turnaround for your internal and external customers, and charge-back functionality so they pay for what they use.